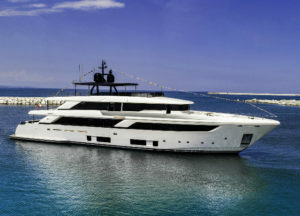 The Ferretti Group celebrated the launch of the new flagship and first superyacht over 300 GT for its brand Custom Line, the Navetta 42. The great expectations raised by the new Navetta 42 have been rewarded with her launch, which took place at the Ferretti Group Superyacht Yard in Ancona. The result of a design process that has kept the Product Strategy Committee led by Piero Ferrari, the Group Engineering Department and Studio Zuccon International Project busy for more than two years, the new superyacht projects a vision of the sea expressed by design in motion, sophisticated elegance and extraordinary performance. Both the interiors and exteriors of the new Navetta 42 can be extensively customised so that each owner can create their own dream boat. The layout optimises the way the generous spaces are used, adopting an innovative and attentive approach to the organisation of the interiors and particularly the outdoor settings, which exploit the four decks to the full to offer the utmost privacy and comfort at sea. A huge suite on the main deck is reserved for the owner, while the layout on the lower deck features four VIP suites. The captain has a spacious living area forward on the upper deck, with a private cabin and direct access to the main helm station. All the interiors of the first Navetta 42 unit have been customised according to both the owner’s desires and the perfectly tailor-made style embodied by Custom Line, which is expressed at its very highest bespoke level in the Navetta line.